Spring is here. Or is it? I'll believe it when I see it. The date is officially tomorrow, March 21, but since it's been so unseasonably warm here, I figured I would get a head start on my spring vegetables (I did see rhubarb in the grocery store, a sure sign of spring!). The local asparagus is not available until May in these parts, but I thought I would share this one with you anyway, just in time for Easter (you can thank me later). This is my favorite asparagus tart so far, and I have made MANY. The original recipe calls for a good salami, but I substituted speck (a smoked prosciutto). If you can't find (or don't want to spend the big bucks) on Comte, a French style Gruyere (that is so good! ), then substitute a Gruyere or Swiss. Even Parimigiano Reggiano is a nice choice. And here is that puff pastry again.....I took Claudia's suggestion and wrote to Pepperidge Farm, telling them how much I like their product and constantly blab about it on my blog and that I should get a lifetime supply of puff pastry as advertising fees. Well, don't you know, a week later, I received a coupon in the mail for -$1.00 off the purchase of their product. WOW, what sports. (no comment). Roll out the defrosted puff pastry to fit a half sheet pan. Keep chilled in the fridge until ready to use. I blanched my asparagus spears in some water in the microwave for 2.5 minutes and they came out perfectly, but you can blanch them anyway you like, I was being lazy. Cut 2-3" from the tops of the asparagus. Mix with a tablespoon of olive oil and set aside. 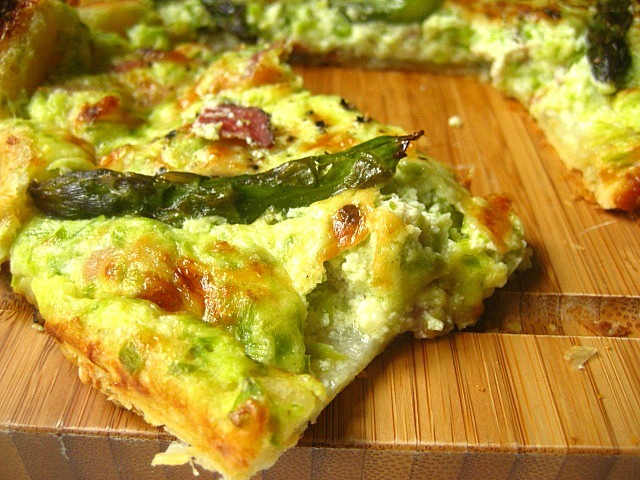 In a food processor, puree the ricotta cheese, egg, 2 tbsp olive oil, salt and asparagus stalks until a light green puree forms. 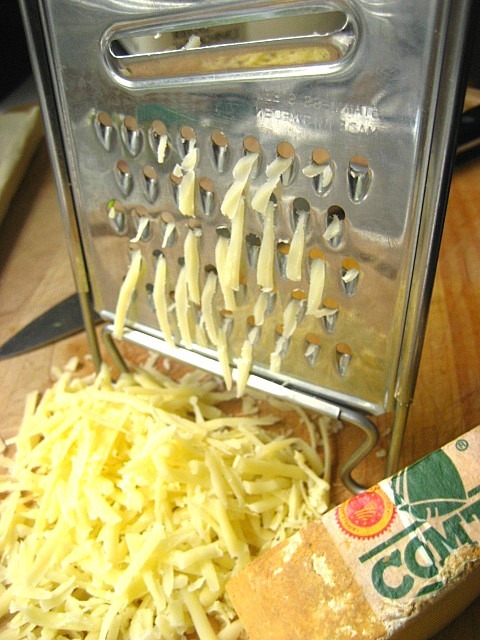 With a spoon, hand mix in the chopped salami or ham and 1/3 cup of Comte cheese (do not process in the machine). This is your filling. 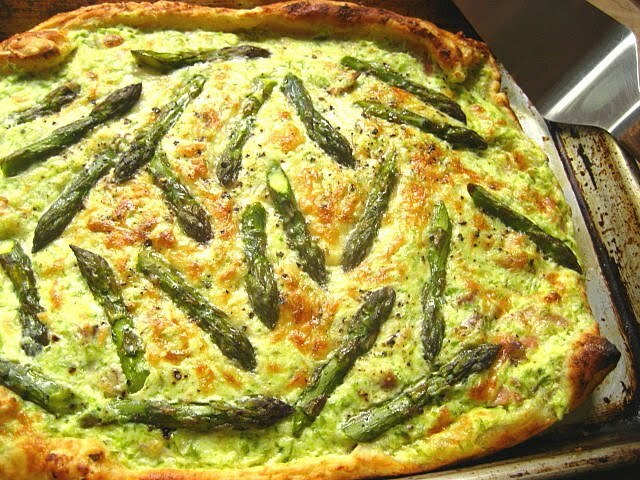 Spread the asparagus ricotta filling over the prepared puff pastry on the half sheet pan, leaving a 1" border on the sides. Carefully fold over the sides and brush with an egg wash or cold water to seal the edges. 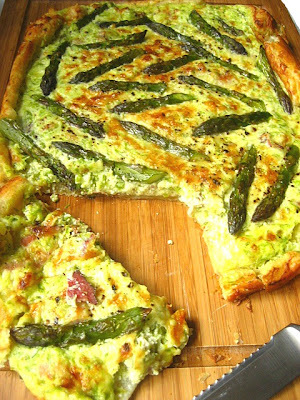 Sprinkle a bit more Comte cheese over the ricotta and decorate with the asparagus tops. Bake for 23-25 minutes in a 400F oven. Let rest for a few minutes before diving in. This smells divine while baking and tastes even better than it smells! This is a beautiful thing to look at first thing in the morning! A $1.00?? They should have stocked your freezer! That is gorgeous. Happy Spring Stace! You're cute when you're mad. This looks so good! I stock up in December when Trader Joe's has puff pastry sheets. 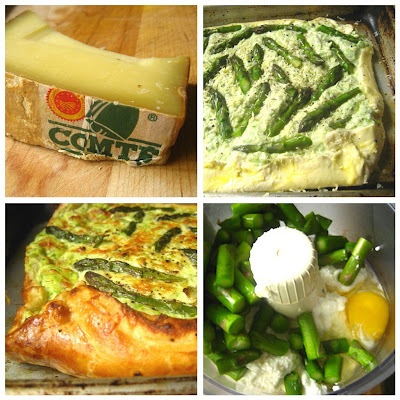 He may call me a hoarder, but my husband will happily dig into this tart when I make it! Love asparagus at this time of year! And of course I love all your tarts. I'll only believe its spring once the asparagus stops being so expensive! This tart looks delicious! Wow, how generous of them. Your tart should win a prize - it looks fantastic. Yay, another delicious-looking recipe using asparagus, I can't get enough. Love this time of year when stores have .99/lb. sales on it. Makes me want to buy ten pounds! Needless to say, shopping requires a great deal of self-restraint during asparagus season!